Powered by a 3.6-liter V6 engine with electric motors assisting propulsion. 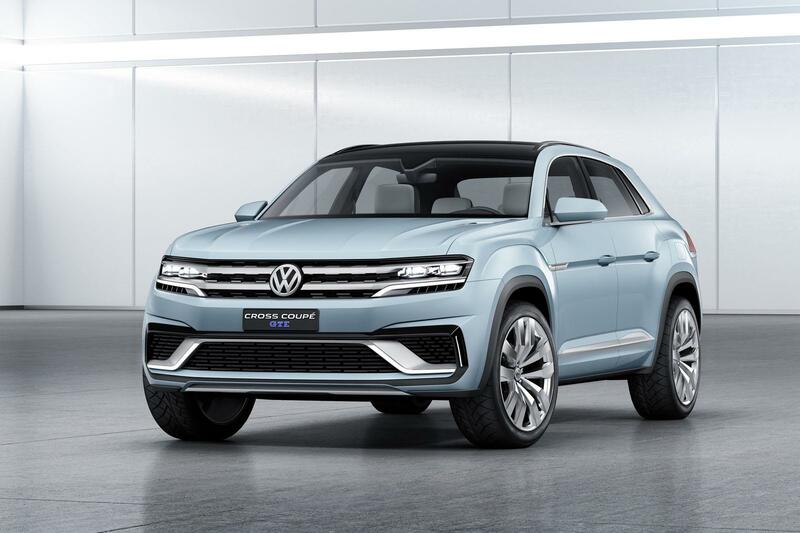 Ahead of its world premiere at the 2015 North American International Motor Show (Detroit Motor Show) tomorrow, VW has revealed the Cross Coupe GTE concept, previewing the design of future SUVs from the brand. The concept measures a generous 4.8 m in length. VW has also confirmed that in late-2016, it will start production of a 7-seat mid-size SUV at its Chattanooga, Tennessee plant. Speaking about the Cross Coupe GTE, the concept measures 4,846 mm in length, 2,029 mm in width and 1,734 mm in height. It is presented with 22-inch aluminium wheels shod with 285/40 tyres and painted in a 'Grand Pacific Glacier Blue' shade. It uses a V6 plug-in hybrid drivetrain which combines a 3.6-liter FSI engine with two electric motors. Combined, the Cross Coupe GTE makes 355 hp and 380 Nm of torque, and gets an AWD system. It accelerates from 0-96 km/h in 6 seconds and hits a top-speed of 208 km/h. The concept features five driving modes and can be solely run on electricity as well. Engineers have equipped the Cross Coupe GTE with four driving profiles: On-road, Off-road, Sport and Snow; and five drive modes: E-Mode, Hybrid, GTE, Off-road, and Battery Hold/Battery Charge. Like its preceding concepts (the CrossBlue and the CrossBlue Coupe), the Cross Coupe GTE is based on the MQB architecture. The mid-size SUV which will enter production in 2016 will likely take a bit of design inspiration from these concepts, but more from the Cross Coupe.